I’m sure that most of us just want to go rowing, but there are some sad people who think about dry and dusty things like the rules. Later this year when we go to the Skiffieworlds there will probably be quite a few who are not just sad but a little upset as well, because we are likely to see modifications in construction that we discussed during our own build but rejected as outwith the spirit of Scottish Coastal Rowing. The viral growth of the fleet has taken everyone by surprise and it’s clear that the measurement rules would have been much more tightly drawn had this been anticipated. As a result SCRA has commissioned a full review of the rules with a view to bringing in amendments for discussion at a future AGM. I am a member of the group charged with considering the existing rules, gathering views and offering advice. All of us on the group are wearing two hats, because we are also involved in our own clubs and want to win races. Now that we at Seil are on the water and gaining our own experience we should be thinking about the issues surrounding the rules, so that we can adopt a position at any future SCRA meetings where amendments are discussed. I’m posting about some of the issues, in the hope that it will stimulate thought and perhaps a bit of discussion through comments. I suggest that it’s possible to identify a number of quite distinct reasons why we need rules for boats in a class. I can think of four, safety, strength, speed and spirit. There may be a fifth that spoils the alliteration, cost, but with the kit-built skiffs I suspect it’s less important than we think, as the big items are all fixed. I won’t waste time describing why the first three are important. By spirit I mean the range of emotional factors that have come together in the last three years or so surrounding the St Ayles skiffs and their communities. It’s a mixture of nostalgia reflecting the history of the boat type and shape plus the unique elements that make them attractive and in time will become a tradition. Traditions all start somewhere, usually for good reasons which get lost as time passes. All sports have them for a variety of reasons, good and bad. Good reasons tend to reinforce the sense of belonging to a community, bad ones lead to exclusivity (c.f. certain bowling and golf clubs). We’ve all come across this, probably without actually acknowledging that in a sport one can do things for no obvious practical reason. In our rules group I have argued that we should be aware of the importance of spirit and not shy away from promoting it as a value. It’s actually the only reason why any of us would take to the water in an attractive, slightly old-fashioned looking wooden boat with oars hanging off wooden thole pins and a flag pole on the front. Otherwise we’d be scooting about on sliding seats in carbon fibre contraptions and probably wearing designer lycra. Scandinavian, ultimately Viking, boat shapes. Recreational and competitive rowing in our east coast towns, particularly among the miners, but also on the west coast and island communities. Traditional styles of rowing with long oars, kabes or thole pins. The rules as presently expressed do refer to the spirit of the St Ayles skiffs, but there is a lack of detail, also an apparent reluctance to be open about the importance of this. As a result particular provisions designed to entrench the spirit have been justified on the other grounds, safety, strength speed and cost. In the group I have argued that we should have the courage to acknowledge that rules making a boat strong may have nothing to do with safety, rules about speed may have nothing to do with either of those and rules about spirit absolutely nothing to do with any of the others. Some of the issues are fairly clear. For example as we learned during the build adding rocker by reducing the keel at the ends is not allowed. Others are less so. Here are some of them. The rule requiring these to be of wood has been justified on cost grounds, but metal crutches are demonstrably cheaper and longer lasting that wooden pins or kabes. Also some clubs have made clever wooden imitations of carbon fibre racing fittings, enabling oars to be feathered. As a consequence of clever woodwork feathering has become possible and seems to be within the current rules. We have to think about whether or not this is the style of rowing the clubs (and we personally) want to see. Should feathering oars be banned? On balance my personal view is, yes, they should be. I would argue that the traditional system with kabes or pins is central to the experience and much easier for inexperienced rowers to master. My views might change after a lot of hard upwind work though. Spoons are disallowed, ostensibly on cost grounds. That justification doesn’t stand up, because it’s cheap and easy to laminate curved blades using the same procedure as we did with the stems. It seems truly a question of spirit. The existing rules allow a number of specified traditional materials apart from wood – “Brass, Silicon Bronze, Stainless Steel, Gunmetal” and go on to say “The only synthetic material permitted in the boat construction is the glue which should be of Marine Quality, and will usually be Epoxy resin or a Polyurethane glue”. I think everyone has problems with the letter of this. 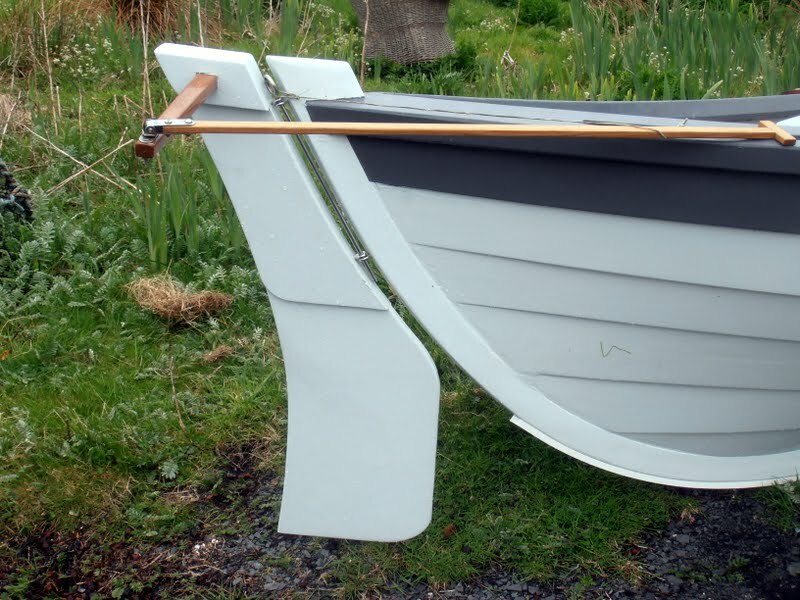 Our polypropylene strips are illegal, but most skiffs have something similar, as bronze ones cost about £300. One recent skiff is said to have stainless steel thole pins, done with no intention to gain an advantage. Footrests are not shown in the plans, but are necessary for rowing efficiently. A discussion is ongoing about the extent to which they may incorporate metal adjusting/strengthening strips. Alec Jordan’s original view was that the design should be completely open, to allow ideas to develop. During our build we discussed how it would be better for the pintles to be in a vertical line to the water and how this could be done with an outrigger. We decided not to do this and to keep the leading edge following the aft stem. Given the lack of a rule banning outriggers it will be interesting to see what people turn up at Ullapool with. Later this year clubs will be asked to comment on these issues and if they want to entrench some basic principles which would purely be intended to preserve the spirit of inclusive community participation and the obvious good things that are causing this project to grow so quickly. It will be interesting to see what each regards as important to the experience of being involved with the St Ayles skiffs. We should be thinking about our own contribution to this. I await our own discussion with interest. This entry was posted in Building the boat, Rowing. Bookmark the permalink. 10 Responses to Rules – What are they for? What is their status? You don’t mention the oars, Ewan? We had a good experiment with your ‘formidable ladies’ last night, adjusting the gearing with positions 2 and 3 rowing with effectively shorter oars – but that had un-anticipated effects on the position of the footrests which they felt should be wider to allow for a stagger (not to hit the rower in front) … all is much easier if everyone is bang on the stoke, however! The issue was that especially in the central two positions we ladies (with short arms/legs) have to sit further over in the seat meaning that one foot is off the foot rests. We tried changing the gearing which helped the rowing position but we ended up hitting the people in front! maybe to do with being off the stroke but we went back to the original positions. Very interesting. I found the footrest on the Chris o’Kannaird quite uncomfortable when rowing off centre and felt it would be better slanted, as both my legs are about the same length. The problem with bumping is supposed to be worst when the oars are about 12 feet long, which is why teams have gone for either shorter, as we have (11ft 3ins) or longer (up to 16 ft). Lily Rose of Achitibuie, the lovely new boat, has offset the seats so that rowers have to sit opposite the side their 16 ft oar is on. I was intially worried about 16 ft oars, which are heavy out of the boat, but am beginning to wonder if they might in fact be better. You take much slower and longer strokes and immerse the blade for longer. When time permits I may make some of these, with hollow outer sections to improve balance. Perhaps we should set up a special oar-making class, as in future people may want to experiment further. In answer to Sue’s point I think there will always be different views on oar length. I guess that truly traditional oars would veer towards 16 feet, which many would find intimidating. Finally I don;t know how children and very small people find the long oars. It’s possible that Lily Rose may have inadvertently made it difficult for them to be involved. When it comes to oars, gearing seems to be more critical than length. Certainly different clubs have managed to be successful with very different lengths of oars. And in other rowing traditions Juniors often row with different oars, with a reduction in effective gearing through using smaller blades. We found that when we we in tune with stroke we did not bump in to the person in front of us. Portobello started out with the 14′ oars specified in the original plans but found them unwieldy. After a lot of alterations we ended up at around 13′. Whilst that put you in a seating position where clashing was an issue, if everyone rowed in time it was fine. In fact it was guide to you’re rowing: if you were gently hitting the person in front in the kidneys, and being hit as well, you were all doing pretty much the same thing. However, that was with loose oars. With the fixed pins it seems an awkward length for some reason so we’re aiming to increase length again to 14′ or more. Don’t go for 16′ oars in the middle. They won’t fit in the boat without a gearing that’s too high. Achilitbuie are about 15′ 4″ and that’s about as far over as you can be pushed. In fact, don’t start with oar length. Think about where you want to sit, where your hands are on the handle, then work back from there. Effective gearing isn’t just dependent on inboard/outboard, but it’s a good starting point. It seems that the shorter the oar, the higher the gearing that can be accommodated, but the range is still pretty small. What’s best may also be affected by conditions, but the range is around about 2.5/1-3/1, inboard to outboard. As to feathering, clever woodwork is not required. We’ve feathered with unfixed, round, leather sleeved oars, between a simple kabe & pin. But that requires a lot of skill and effort and on balance probably put us at a disadvantage. The issue isn’t feathering as such, it’s the pivot mechanism for the oars. Sean, your views are very interesting and helpful, thanks. Are you coming through at the weekend? I think it will be great for us to have a look at the Porty boat and perhaps for some of us to try taking a row on her. I agree about feathering. The clever stuff makes it much more comfortable and therefore possible to do. Can’t make this weekend unfortunately. Hope you all have a great time.